I also haven’t (and I’m ashamed to admit this) worked out for the past two weeks, for the very same reasons. So the photos and measurements you’ll see below really are taken after a two week “break” from the workouts, which involved prolonged sitting at my computer and at the wheel of our car. In spite of the circumstances that came together to sabotage my workouts, progress was made. I’m happy about that. Here’s what I look like now. Compare the difference between these photos and the initial ones (taken after a week on the system). 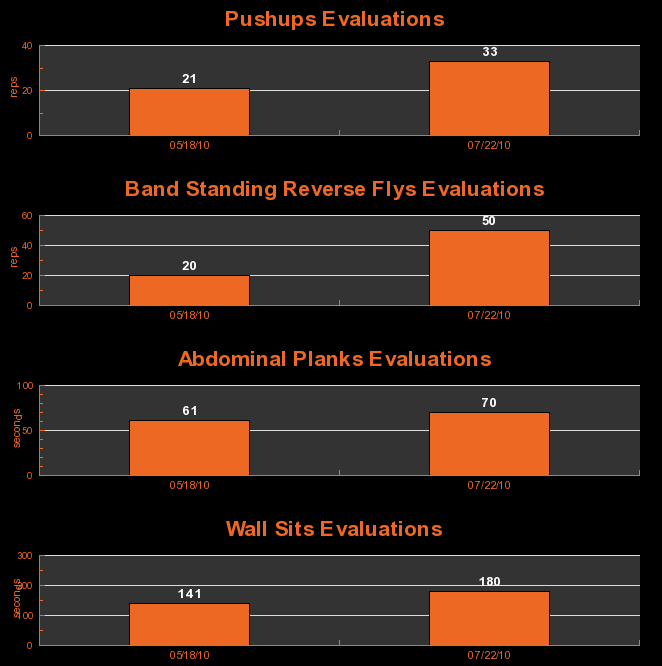 Here are my re-assessment results (power score and measurements). Compare them with the initial ones. 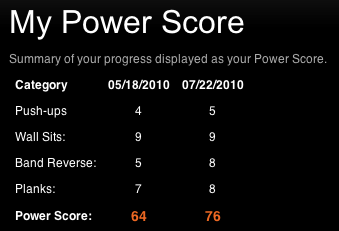 I was pleased to see a marked improvement in my power score, which is now 76, up from the initial 64. My guess is these are beginner gains, and subsequent power score improvements will be harder to achieve. Still, I’m happy and willing to put in the extra work. Arms: 12″, down by 1 inch; this was an unpleasant surprise, but my guess is I had extra fat in the triceps area, which went away. 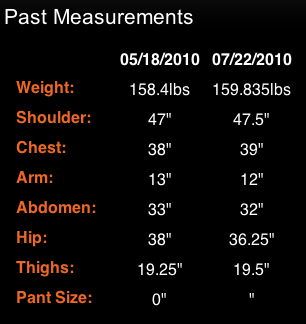 Hips: 36.25″, down by 1¾ inches, which was definitely a surprise. I guess all that sitting on a chair not only atrophied my muscles, but put extra fat on my arms, around my abdomen (which I already knew of) and my hips, which I didn’t know about. I missed about a week’s worth of workouts during the 6 weeks, again due to travel. I asked the folks at RPM what to do, and they advised me to do one extra workout per week until I caught back up. That’s excellent advice, so if you’re in the same boat, do that, it’s going to be worth it. I haven’t done my aerobic workouts at all. I’ve been too busy. You know how they say you should do three of their workouts per week, and on your off days, do half an hour of your favorite aerobic activity? Well, I skipped out on that entirely. Shame on me. Still, in spite of cutting all those corners and missing out on plenty of workouts, look at the progress I made! Can you imagine how much more dramatic my progress would have been if I had followed their recipe? I think this is really good proof of the program’s potential. I missed workouts, played catch-up, took a two week break, and still I made out really nicely. Don’t take that to mean I fudged on the actual workouts though! Every time I worked out, I did every exercise and every rep indicated. On some exercises, I even did extra reps. The way I see it, if I didn’t give 100% with every workout, I’d have cheated myself. If you have any doubts about the RPM System and whether it can work for you, I don’t think you need to worry any more. Try it out, you’ve got nothing to lose. It’s only $10/month, and you get two weeks free with this code: 553677456. I intend to keep going, and will post future updates about my progress.